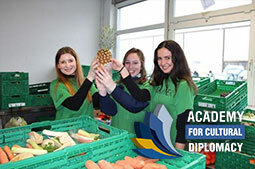 The methodology of the Center for Cultural Diplomacy Studies provides students with the opportunity to develop interpersonal skills and inter-cultural experiences by encouraging participation in a variety of volunteering projects around the community, here in Berlin. Berlin is a diverse and vibrant city, and taking part in our volunteer program allows students to meet people from all walks of life and gain a deeper understanding of the various social problems still affecting this fast paced urban environment. By volunteering, students can take an active role in tackling these problems whilst being rewarded with a personal sense of achievement through their hard and well appreciated work. CCDS Partner: The "Berliner Tafel"
Statistics show that it is not a lack of food that leads to famine in many parts of the world, but rather poor and unequal distribution. With this in mind, The Berliner Tafel has been a registered charity since 1993 and its mission is to distribute food, which might otherwise go to waste, to the underprivileged and homeless of Berlin. Each month they distribute 660 tons of food, reaching 125,000 people and each year they are able to help more and more people with the continuous expansion of their volunteer force. With the help of participating supermarkets and social organizations/churches, The Berliner Tafel achieves its aim by collecting left over food from supermarkets and bringing it to the wholesale food market, for volunteers to sort through and separate the 'good' from the 'spoilt'. The good food is then distributed to more than 300 organizations across Berlin to be prepared and served to disadvantaged people of all ages and backgrounds. How can CCDS students contribute? The CCDS has been sending groups of volunteers together with ICD staff members, volunteers and members to the Berlin Tafel every week, for years. This opportunity is open for any CCDS student at any time.